Recently a Global Media Outreach contact asked me, "What is the difference between instinct, and the direction of the Holy Spirit? How do I know when the Holy Spirit is speaking to me?" That's a very good question, a very important question! I know from personal experience that it can be quite challenging to discern (when you hear a "still, small voice" in your spirit) what is coming from you, and what is coming from God. First of all, I think it's important to realize that the Holy Spirit speaks to us in a variety of ways. The most significant one, I think, is through Scripture and prayer. As you are reading or listening to Scripture and meditating on it, and praying over it, many times you will realize something that God is trying to apply directly to your heart. This is the Holy Spirit speaking. As a Bible teacher, this has happened to me, time and again. And sometimes His commands are very direct. Once I was visiting a renter, driving a small pickup truck. I stopped by to pick up rent. When I spoke with the lady of the home at the door, I did notice there were young children around, but didn't think much of it. I went back to my truck and started the engine, prepared to leave. Suddenly I had a very distinct and shocking impression that something was very wrong. It was just as if someone had shouted "NO!" but I didn't hear an audible voice, or anything like that. I sat there, stunned, my foot on the brake. It was a very strong impression, and I had no idea where that had come from. Confused, I put the car into "park" and got out and looked around. To my shock and horror, I discovered a young boy, maybe 3 years old, sitting playfully on the back bumper of my truck. Had I backed down that driveway, as I intended, I would have probably run over and possibly killed him. I am absolutely sure that God issued that very direct and unmistakeable command to me, in order to save that child's life. (Read the whole story here.) I also put dreams and visions in this same category: Dramatic ways God occasionally (but not usually) speaks to us. Another way the Holy Spirit speaks to us is through brothers and sisters in Christ who are committed to God and whom you trust to tell you the truth. If a brother shares something with me, I take it to God in prayer. "Is this true?" I ask. "Is this from You? Please confirm this, if so." 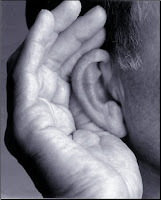 Then my conscience (which is yet another way the Holy Spirit speaks to us) will often let me know whether or not it is. First, it must not violate any principle of Scripture. For instance, is what you are hearing in complete harmony with the character of God and the fruit of the Spirit? If so, it may be God speaking. Take it before the Lord in prayer, and ask Him to confirm it. God is never in a hurry. I believe He loves it when we wrestle with Him in prayer in an attempt to discern His will. I've never been disappointed after doing this. There are times when it is very difficult to decide which course of action God desires you to take. It is at these times I believe it MAY be appropriate to "lay out a fleece." Remember? This is what Gideon did in Judges 6 when God was impressing upon him to lead Israel. He said (and I'm paraphrasing for length): "If you will save Israel by my hand, then give me a sign." He laid out a fleece (the skin of a sheep) on the ground overnight. He asked: "If in the morning there is dew on the fleece only, and not on the rest of the ground, then I will know you are leading me." And in the morning it was so. But, he still had doubts. So that night he prayed, "If in the morning there is no dew on the fleece, but on the ground all around there is, then I will truly know that you are with me." And the next morning, it was so. So Gideon knew that God was speaking. I don't recommend this third option, in most situations, because to me it borders on "testing God." (Especially, doing it twice, as Gideon did!) Obviously this was a very special situation and Gideon wanted to be absolutely sure he was hearing God correctly. If he had moved forward thinking that God was leading, when He really wasn't, it would have been disastrous for all. Along the lines of a fleece, if I think I am hearing a still, small voice from God, in addition to praying it over, and filtering it through Scripture, and talking with trusted Christian friends, I will finally pray: "God, I believe I hear You speaking to me. So I am going to step out in obedience. But Lord, you know that I am dull of hearing. If I am not hearing You correctly, Lord, would you please shut a door in my face and prevent me from misrepresenting Your will." 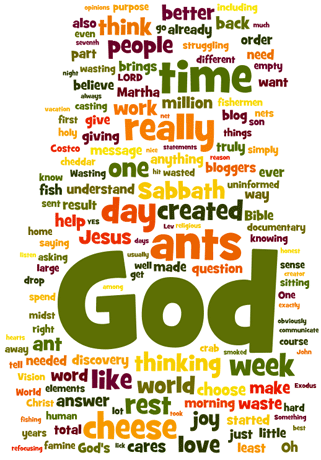 I don't believe God will let us misrepresent Him, if we truly seek His face in a matter. Is that helpful? Please let me know what you think. By the way, sometimes God will speak to you, through others (or to others, through you), and they (or you) won't even know that's what is happening. This has happened several times in my life. God has spoken a divine word to me through someone who had no idea he was sharing something from the Lord. Or I have shared something with a brother — a thought, or an impression, or even an opinion — which God used to speak truth to their heart. Later, they shared with me that it was God speaking to them, through me. Even though I was unaware of this at the time. When have you heard God speaking to you? What did that look like? I was chatting with someone on Twitter tonight who asked if I'd ever experienced a true miracle. I told him about the three big ones in my life, and how I had blogged about each. First there was the Muslim taxi driver in Trinidad who came to Jesus after God used him in a miracle. Then there was the time in Southern California God protected a small child (sitting unbeknownst to me on the bumper of my truck) from injury as I was about to back over him. And finally, there was my mountainbiking accident in 2003. But when I started looking for this on my blog, I soon realized I had never actually told the story here. So, here goes. It was August 2003 and my wife and I were taking our daughter Mandy to Southern California for her first day of college at Pt. Loma Nazarene University (PLU). We drove down in order to haul her stuff, so I also took my mountain bike, as I had long wanted to do some biking in the beautiful mountains of the Angeles Crest Forest. I had a full day to kill before orientation at PLU, so I started early on a Friday morning, parking my car at a popular trailhead then grinding up a long, arduous forest service road (which eventually turned into hiking trails). Four or five hours later I had achieved a peak which crowned the local ski summit. I rested up a bit then started downhill, which was my reward for the long, grueling hours of uphill work. I had a lot of fun slaloming down the dirt trails, and then reacquired the forest service road. It was a rough, single-lane asphalt road, bordered on the south by a steep drop into a canyon far below. But I was enjoying myself, and after it turned to asphalt I let the speed out a little. Hence I was going a little too fast, perhaps 25 mph, as I turned a corner coming down the hill maybe halfway or so down. In front of me suddenly appear a gully filled with large rocks, where the asphalt had washed out. Had I been an experienced mountain biker, rather than trying to brake I would have brought the nose up high and tried to power through the rough spot. Instead I hit the brakes with all my might. And slide right into the washout. My front tire caught the asphalt lip on the far side of the washout and pitched me forward. 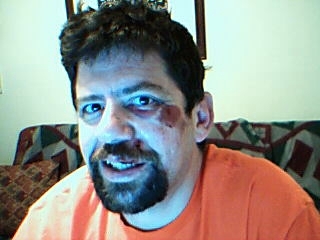 I took the full impact of the broken asphalt on the far side of the gully, right on my face. Fortunately, I was wearing a helmet. The top portion was crushed by the impact with the asphalt. (I have no doubt I would have died, had I not been wearing one.) But, unfortunately, I wasn't wearing a face shield! My right knee was also torn open and blood was pouring down my leg as well as my face. Healing up from my injuries. I lay there or sat there on the asphalt for awhile, my head swimming, stunned and grappling with the sudden immensity of unbearable pain. Eventually, I struggled to my feet and began to examine my bike, which was no longer rideable. With nothing else to do, I began to limp down the hill toward home. But I had no idea how far away that was. I had seen no traffic whatsoever all morning and was very alone. (Had it been a Saturday, there might have been hikers.) I had also had 0 bars on my cellphone all morning -- no signal whatsoever. So I limped along down the hill for about a half hour, making as best time as I could, but I doubt if I traveled more than a mile down that hill. Probably half that. And then, I began to feel quite faint, and suddenly knew I couldn't take another step. I had lost a lot of blood, the pain had been intolerable and I felt as if I might pass out. So I sat down by the side of the road and considered my situation. I took my cellphone out again and stared at it. 0 bars. I had no options. So I shot up the quickest and most desperate prayer of my life. I think I said, very out-loud: "Please help me, Jesus! I don't want to pass out here and become food for mountain lions. I don't want to die. I need a miracle!" I then looked down at my cell phone again. Zero bars. But suddenly, in front of my amazed eyes, it shot up ... 1, 2, 3, 4, 5 bars! I thought I must be hallucinating. I dialed 9-1-1. It started ringing. I counted 20 rings before there was an answer. "9-1-1 ... what's your emergency?" I explained that I was in the Angeles Crest and I'd had a serious mountain-biking accident and needed help. There was an awkward pause. "Angeles Crest? You mean as in Los Angeles?" "Yes, the mountains north and east of Los Angeles," I replied. "Where are you?" "San Diego," he answered. About 150 miles due south of where I sat, covered in blood, on that dusty roadside. That wonderful 9-1-1 operator then jumped into action. "Don't worry," he said. "We'll figure out exactly where you are, and get you help. Do you know what county you're in? Are you in Los Angeles County?" "I'm not sure," I told him. "I'm near the border between Los Angeles and San Bernardino Counties, I think." "Well," he reassured me, "I'm dispatching a rescue helicopter from San Diego right now. But I'll also get both San Bernardino and Los Angeles county rescue units on the line and we'll figure out which one is closest to you." As it turns out, L.A. county rescue was closer. They said they knew approximately where I was and were dispatching a rescue unit up the trail. As soon as that was over, the 9-1-1 operator said reassuringly, "Okay, Larry, I'll stay on the line with you until they get there." I was about to say, "That's great," when all of a sudden the line went dead. I looked and the 5 bars of service dropped back down to zero. Darlene and my daughter drove down to the emergency room, and my very patient wife (who is an R.N.) even helped stitch up the wound in my cheek. After lots of x-rays and bandages, I was released. Mandy had planned to be a nursing major at PLU in San Diego (ironically!). But when she saw my swollen and disfigured face, she decided that day to change her major to art! The next morning the three of us drove down to PLU for Mandy's orientation. Much of that day she spent explaining to people: "This is my dad ... but he doesn't normally look like this." After a month or two my broken cheekbone fused and healed up fine. (You can't actually set a broken cheekbone, I learned.) My dentist did wonders repairing my broken teeth, then probably took a vacation to the Bahamas afterward on the earnings. The wounds to my lips and mouth were very painful for a week or two, but eventually my cheek wound healed and now the scar is pretty much covered by my moustache. You can still see damage on my nose, if you look carefully; but I'm not a model anyway, so what the heck. But most importantly, I learned that prayer should not be a last resort when you are in trouble! God cares about us, and He is standing by to help when we really need Him. Just remembering the sight of those reception bars on my cellphone zipping up from 0 to 5, the moment after I prayed, has bolstered my faith in many a crisis since that day. How about you? Have you ever witnessed a true miracle?